This image was released on Feb 26, 2016. Do you want three massive towers rising 12, 10, and 8 storeys at Venables and Commercial? Do you want 200 expensive market condos to flood our neighbourhood? Do you want to drive land prices in Grandview-Woodland even higher? Do you want to put neighbourhood non-profit, rental, and other affordable housing at risk for upzoning and demolition? Do you want even more towers like this in the future? Do you want to see city-owned land turned over to private developers for their profit? Do you want to exempt governments from funding needed social services like the Kettle? Do you want to hand the future of our community over to developers? Talk to friends and neighbours. Put NO TOWER signs in your windows and yards (no.tower.lawn.sign@gmail.com). Participate in the upcoming Grandview-Woodland community plan discussions. Send letters to the editor, particularly at the Straight, the Vancouver Sun, Global News, and CBC Early Edition, which have presented one-sided stories. Posted in Community on February 29, 2016 by pennystreet546. Thousands and thousands of residents and visitors who love Commercial Drive and the neighbourhood vibe, have already signed our petition against the Boffo Tower and calling for a more community-friendly alternative. If you haven’t signed yet, you can do so at Grandview Park next Friday afternoon or, perhaps more conveniently, online at our petition site. These are just a few of the hundreds of comments left by residents. The real question is: Why isn’t the developer (and its supporters) listening to what the community is saying? Posted in Community, Petitions on November 17, 2015 by pennystreet546. Over the last few days, at least three people have let us know that they cannot support our campaign because “lots” of low-income housing will be made available in the Boffo Tower. Other than the “up to 30” units for the Kettle’s mental health clients we were not aware of any such low-income housing being made available; and they are certainly not mentioned on the kettleboffo website. A message to the developer, Daniel Boffo, for clarification remains unanswered at this time. However, the Kettle’s Director of Community Services was more forthcoming on Twitter last night, and he confirms that he knows of no low-income housing in the project other than the rooms set aside for Kettle clients. So now we are clear: the Boffo Tower project will include 150-200 high-priced condos, “up to” 30 studio units for the Kettle, and no low-income housing. What is less clear is how this rumour — which seems designed to gather support for the Tower — got started. Someone had to tell these people the inaccurate information; the mystery is who? Posted in Community on November 10, 2015 by pennystreet546. The NO TOWER campaign may seem to have entered a quiet period right now, but don’t be fooled by the surface calm; there is a lot going on beneath. Our public information booth at Grandview Park has been missing this last couple of weeks, due to the onset of Vancouver’s famous rains. However, we keep an eye on the weather forecasts and try to pick our days. We will be there on Monday 9th, for example, from noon until 4pm. Stop by and chat if you have a minute or two. At the booth, we have spoken with literally thousands and thousands of residents and visitors. We would venture to suggest this exercise has been the most community-rich and community-involved campaign since the Freeway days. Most of the 3,200 signatures we now have on the petition have come from these personal contacts and conversations. We are also in the process of completing delivery of our informative flyer to every household in Grandview. Without the money and the PR agencies that the developer has been using (in the absence of any other community outreach), this is a labour-intensive task for volunteers. We hope to finish the delivery soon. We are happy to report that the number of NO TOWER lawn signs continues to grow. Unfortunately, we also have to report that a number of our lawn signs continue to be vandalized and stolen throughout the neighbourhood, Several more were taken in just the last few days. It seems this childish behaviour is likely to continue for as long as we campaign. If your sign goes missing, or if you want to order a lawn sign, please contact us at no.tower.lawn.sign@gmail.com and we will be glad to help. This has also been the season for meetings. Members of the Coalition have already met with a number of City Councillors to make sure they are hearing the results of the conversations we are having with the community. Efforts are still being made to arrange a meeting with City Planners, though we have been rebuffed by them to date. The Coalition is also in an extended dialogue with the Kettle regarding a meeting. We hope to have that resolved soon. Finally, the Coalition continues to develop a positive wing to the campaign, by exploring the possible alternatives for the Venables-Commercial-Adanac site that would allow the Kettle to expand and yet stop the imposition of an unwanted tower on the neighbourhood. We refuse to believe the Kettle, the developers, or the Mayor when they say a highrise tower is the only way forward. Our researches into the literature and governmental regulations, and meetings with experts in related fields, have convinced us that there is a range of possible alternatives — and that a condo tower is simply a lazy profit-driven way out. These ideas take time to develop and our meetings continue. More to come. Posted in Community on November 8, 2015 by pennystreet546. These are from your friends and neighbours, many of whom are long-term residents of the Commercial Drive area. The proponents of the tower continue to denigrate these folks as NIMBYs as if protecting and enhancing one’s neighbourhood is a bad thing. In contrast, we praise them — and the thousands of others who have supported this campaign — as heroes standing up against a corporation that seeks only its own profit. Posted in Community, Petitions on October 19, 2015 by pennystreet546. The gentleman, whose name we withhold for privacy reasons, said that he was signing because he “was concerned about the changes to the neighbourhood” that the tower would bring. About 40% of the commenters on our online petition have said the same thing, and it is what we hear time after time at the info table. 3,000 signatures, 3,000 taxpayers, 3,000 voters expressing their opposition to the tower. Will the developer and its allies listen? Will City Council? We can only hope that the clearly expressed views of this community count for something at City Hall. And if 3,000 doesn’t do it, we are on our way to 4,000 now! Posted in Community, Petitions on October 16, 2015 by pennystreet546. In the late 1890’s, Professor Edward Odlum stood at the site of Woodland Park. He must have caught his breath at least once as he stood among tree stumps and pulled in the smell of lumber, mountain air, ocean and the season. At that moment, in that place he said, “Oh, but this is a grand view!” The historic preservation of that moment has become the heritage of this place where we live. In a later political move, the name of this place was changed to Grandview-Woodland. But the woodlands had long since been desecrated and nearly forgotten. 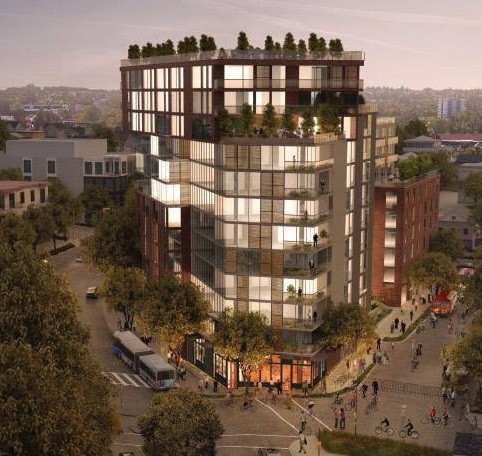 In a recent article, developer Daniel Boffo was quoted as saying that the 12-15 storeys above ground at Commercial Drive and Venables is “not being used. Is nothing but air.” I had such a strong response to his comment. I knew that our community was being misperceived and dismissed as inconsequential. That was some weeks ago. I can’t shake the dissonance that wells up in me when I consider his sentiment. At the northernmost tip of the diversion at Commercial and Adanac Street, there is a stand of trees, sort of grubby trees, but they provide good shade and some shelter from the gentler rains that fall on us. At the base of one of those old trees, a rose bush has made a home for some years. As rose bushes go, it’s rather pitiful. It’s leggy and doesn’t leaf much. But it does send up mighty, tremendous branches that reach the top of the tree. And there, each late spring, giant pink roses appear in the treetop, grinning up at the sun. They appear to have some claim to be there. They do not fail. If I, or anyone, is standing at that same place at the right time of early evening, we can see the rooks gather and convene their parliament for the trip back to Burnaby. They do that, and they permit us to watch. Every evening. At that intersection, cool breezes come down the slopes on the North Shore, across the inlet and along Commercial Drive. That air and the path it travels cools us on summer days that can be too hot. We can see The Sisters/Lions from there. We watch for snow on the mountains, see if fog is rolling in or out; we can feel the seasons change. And later we witness the baring of trees and nests in their branches. The smells of fresh-baked bread and coffee roasting are carried through that air. This is to tell you that the space, the empty air above Astorino’s and the diversion, is occupied. It is being used. It is more than air. It is an extraordinary inheritance. It is the gateway to the grand view and I believe we have a right to speak for it. It is purpose built. We speak to preserve it as an integral part of our heritage. 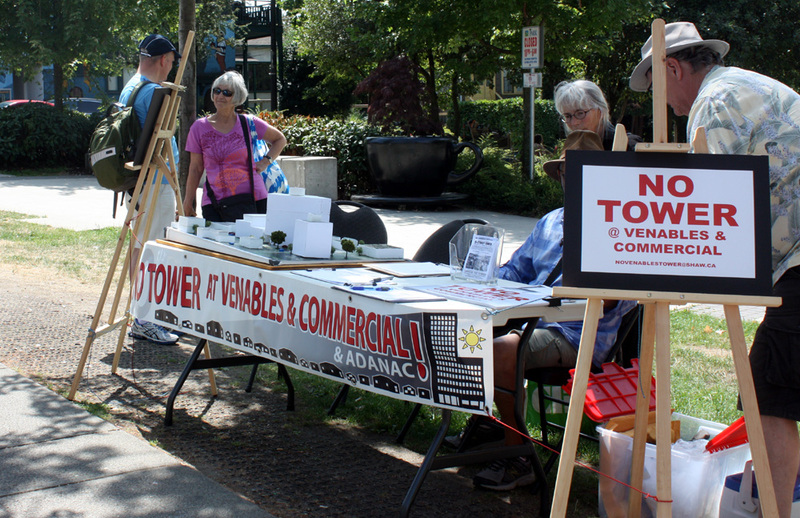 We now have well over 2,000 signatures on our petition that opposes the massive tower proposal at Commercial & Venables. The vast majority of these are Grandview residents, and most of the others are frequent contributors to the economy of the Drive. Both the visiting shoppers and the residents agree that a massive tower is inappropriate for the Drive and should be opposed. In addition to the signatures, several hundred residents have left comments on exactly why they signed the petition. You don’t have to sign the petition to read the comments, but reading them will inspire you with their deep sense of community, and their obvious desire to have an important say in what happens to our neighbourhood. If you haven’t yet signed up to join the thousands in the No Tower Coalition, we urge you to do so today. Posted in Community, Petitions on August 17, 2015 by pennystreet546. Party Moves To Woodland Park! The No Tower Coalition’s street party on Sunday to celebrate the Drive that we love, and to oppose the massive towers that will forever change it, moves to the wider open spaces of Woodland Park! 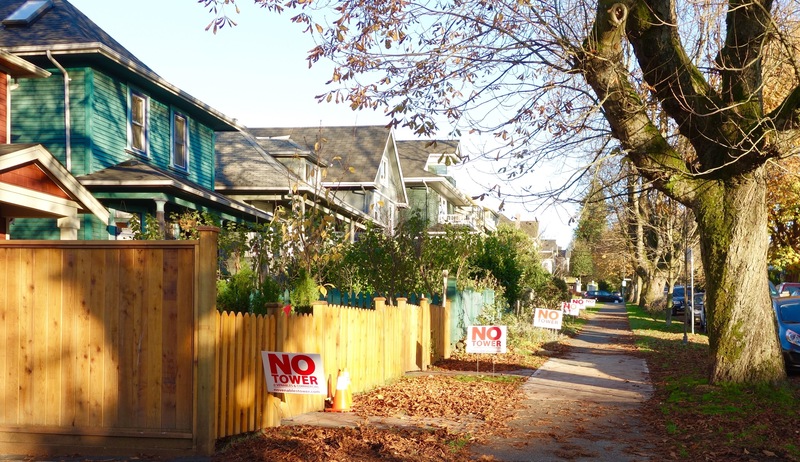 Concerned citizens of Grandview-Woodland will gather next Sunday at 10:00am to celebrate the neighbourhood we all love, and to oppose an oversize project proposed by developer Boffo Properties at the corner of Commercial Drive and Venables Street. Boffo is proposing a massive development for the site, including a 15-storey tower with up to 200 market condo units and an eight-storey tower with expanded facilities for the Kettle Friendship Society. The No Tower Coalition had planned to hold a street party on the site of the tallest of the proposed towers. Mindful of concerns expressed by the Kettle’s Executive Director that an outdoor gathering so close to the Kettle might be misconstrued by their clients, the Coalition has decided to move the party to Woodland Park. 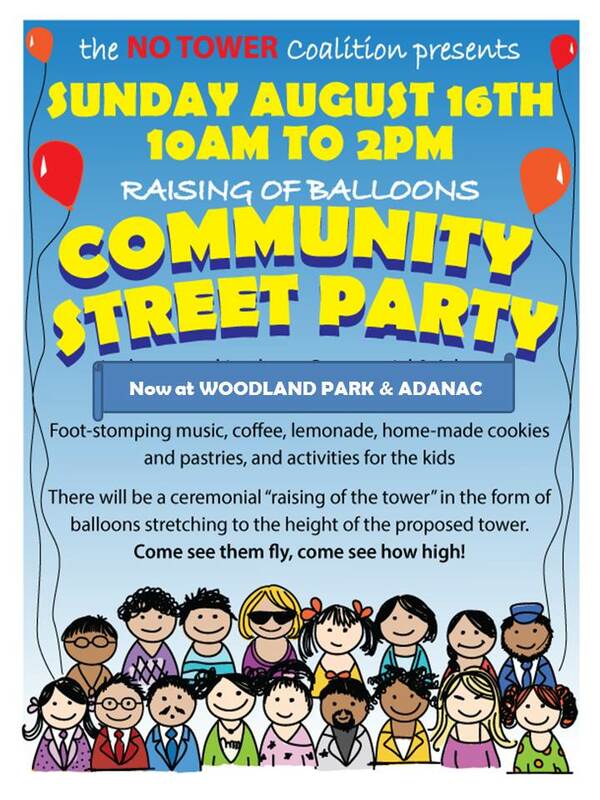 The party at Woodland Park, at Adanac Street and Woodland Drive, from 10:00 a.m. to 2:00 p.m. on Sunday, 16th August, will include free coffee, lemonade, cookies and muffins, activities for kids, and a balloon raising to demonstrate the extraordinary height that the developer wants to impose with its towers on Commercial Drive. The No Tower Coalition is active and growing, with more than 1,900 signatures on its two ongoing petitions against the tower proposal. The group will continue to lobby vigorously for practical alternatives to the project, without a tower. All the members and supporters of the Coalition oppose the building form of the tower and the changes that will bring to the Drive. For many, there are deeper concerns. Services to people with mental illness are part of Canada’s social safety net. They should be publicly funded, in ways that do not have a negative community impact. The No Tower Coalition points out that similar NGOs in the neighbourhood have recently expanded without resorting to private developers and massive development. Posted in Community, Events, Statements on August 11, 2015 by pennystreet546. 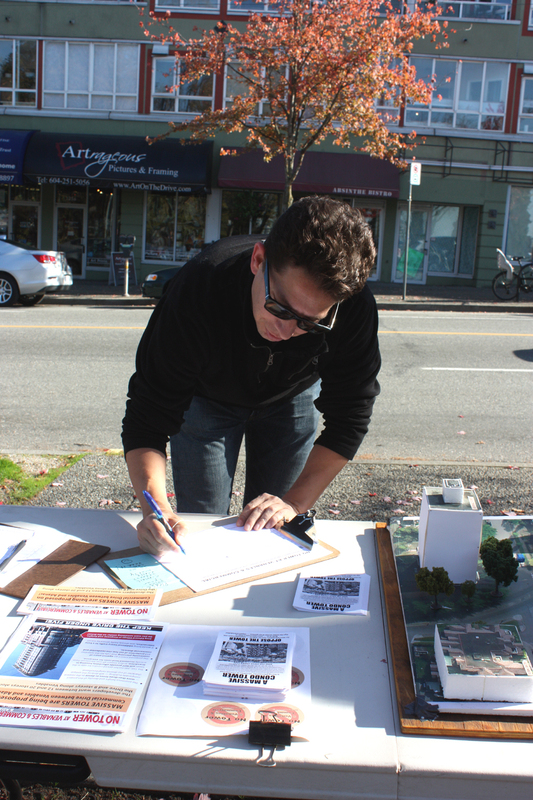 As most of you know, we have been collecting signatures on our petition opposing a large high-rise tower at Commercial & Venables. We have well over 1,800 signees at this point. Most have signed the paper petition that we circulate at meetings and our information tables; but more than 600 have signed online. These are just a few of the hundreds of comments made by Grandview residents in opposition to the Boffo Tower and in favour of sustained funding for the Kettle from all levels of government. 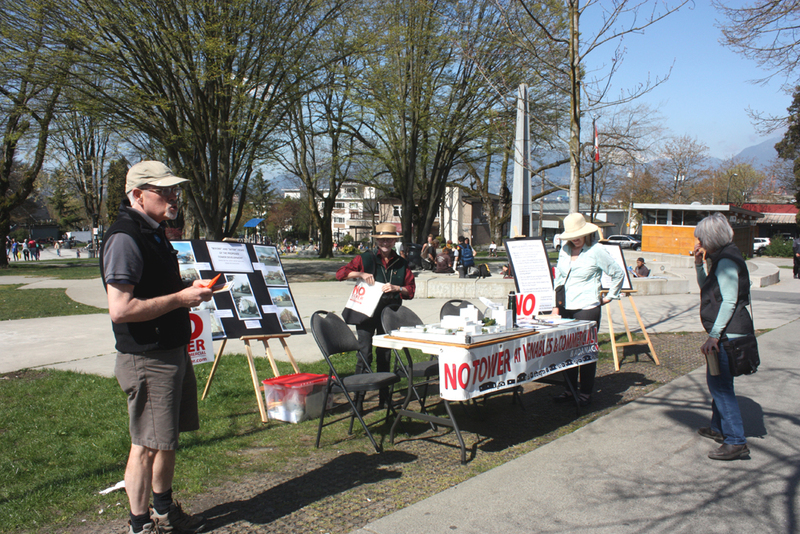 Regular readers will know that the No Tower Coalition has been operating an information table at Grandview Park each Monday, Wednesday, and Friday afternoon for some weeks now. Along with information and discussion, we have offered the residents of Grandview the chance to sign our petition opposing this inappropriately massive tower. We have collected dozens of signatures each day. But last Friday we collected more signatures than we have ever done before on a single day. This week also saw a record number of lawn and window signs being set up, a record number of names being added to our Supporters’ List, an ever-growing list of hits on the website, and a petition signature list that is approaching 2,000 names. The campaign’s momentum is gathering speed at a rapid pace. Many thanks to the folks in Grandview Woodland who have shown their support for our Keep The Drive Under Five campaign. Posted in Community on August 2, 2015 by pennystreet546.